UPDATE: Congratulations to mami2jcn! Comment number 3 - our lucky winner according to random.org. Thank you for all who entered this giveaway. Watch out for the Quest for Zhu DVD movie giveaway coming up soon! To say we're Zhunatics may be an appropriate description. My daughter adores them and if the growing number of ZhuZhus in our house is not a clear indication, then I'm mostly certain that the addition of Zhu Zhu Babies in our collection would surely prove it. And for once, I would say, these babies, they dominate the "adorably cute" department! Just ask my daughter who is squealing like a little girl like she is, right now! She has waited a long time to get these babies! And to get not just one but 5 of them is worth the wait for sure! 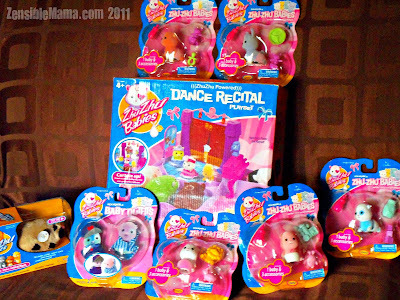 The toys received came with a dance recital playset which displayed the uniqueness of the toy. 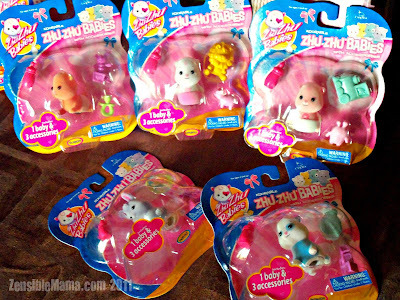 One notably different about the Zhu Zhu babies, besides being smaller than the regular Zhu Zhu hamster, is the lack of the usual mechanism that the toys are known for. The babies have rollers, similar to a computer mouse. It is at least safe for your hair! And that I think, is a good thing. Check the video to see the babies in action and see the rest of the review. Now here's a treat for you. One of you will get the chance to win one of these cute babies! Simply follow Zensible Mama via GFC. Easy Peasy! Deadline: Monday, September 12, 2011 @ 12:00AM EST. You must leave your email address so I can notify you if you win. Winner will be announced no later than Sunday, September 18th. Random.org will be used to select winner. Open to US addresses only, 18 years and older. Winner will have 24 hours to response or another winner will be drawn. Sponsor will send the product to winner (Please allow 3-4 weeks for delivery). By entering this giveaway, you release ZensibleMama.com from any liability in case of lost, unreceived sponsored prizes. GFC follower! My daughter sure would love her own Zhu Zhu baby! I'm a GFC follower (kconklin1028), thanks! I love these new zhu zhu babies, so cute!